Energy-Efficient. Custom-Sized. Handcrafted Bay & Bow Windows. 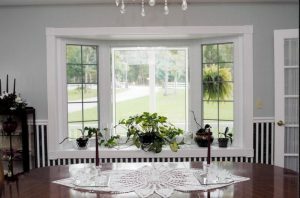 Our Bay & Bow windows are handcrafted to your specifications utilizing only the very finest raw materials. The frames of the window, as well as the head and seat boards, are constructed using the most high-end furniture-grade oak or birch plywood available. The mullion posts between the windows in the unit are not only structural, but they are also completely filled with energy-efficient, die-cut polystyrene foam. The head and seat boards are tied together as one, using steel through-rods, making the unit incredibly strong and weathertight. Each and every window is handcrafted from start to finish, allowing for total control over quality in house and ensuring a perfect window for you and your home. Dual-seal weatherstripping at the sill and head pocket. Triple Duel-seal on the sash.